To over simplify, building spinners, is basically placing a hook on a wire shaft, sliding on a spinner body, then dropping on a blade and forming a closed eye. Before you actually build a spinner look over the three methods of bending the eyes in the wire shafts, listed in the next section, and decide which method you want to try. Then look over the tables listing different spinner designs and choose a few to assemble. The quickest way to end up with a finished spinner is to begin with an open loop preformed wire shaft and then make the finishing eye with a pair of pliers or wire forming tool. When making spinners using this method use a purchased open loop wire shaft or make your own using a wire former. Using your needle nose pliers grab the wire shaft firmly 3/16" to 1/4" above the clevise. ^^ Place hook in eye of open wire shaft. Pinch the two ends together and slipthe desired spinner body over both ends. Nowslideany remaining spinner body component(s) ^f® /down the shaft. With smallspinnersyou | may have to trim the short end of the spinner shaft a little. Do. not twist the pliers. Hold the pliers still "and slowly bend the wire shaft over the top of the pliers 90 degrees. You may wish to slide a crane swivel on the shaft at this time. a Note About Method "a"
If you use a pair of standard needle nose pliers, the final closed eye will look much like a "D" in shape. It looks a little strange at first but it's appeal grows in time. If you prefer a round eye, use a pair of Real Pro's round nose pliers for a perfectly round eye. Apply any die cut prism tape to the blade. Now slide the clevise in the blade hole. Slide the wire shaft through the holes in the clevise, making sure the concave side of the blade faces the spinner body. Continue bending the wire shaft down and around the pliers in the opposite direction. A total of 270 degrees. Remember do not move the pliers only the wire. ow simply wrap around the shaft two times, closely to the pliers as possible. Remove pliers and trim excess wire as close to the shaft as possible. That's it. Using this method you can make spinners in many different sizes. You can even form closed eyes in surprisingly large gauge wires. With practice you will be able to quickly form a closed loop. B. Using Needle Nose Pliers, Wire Cutter and Split Ring Pliers. Use this method when using a closed loop wire shaft, purchased or made using a wire former. The hook will be attached with the aid of a split ring. The major benefit is you will be able to change the hook at any time in the future without having to cut apart and rebuild the spinner. We generally use this method for larger spinners like those used for pike and musky. On these large spinners we must often cut the trebles when removing the spinner from the fish's mouth. So having the ability to change the treble after construction is important. 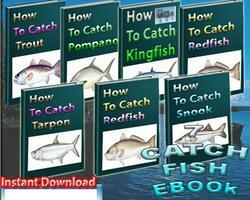 Likewise big fish often destroy the bucktail tied to the trebles. So the need to change trebles might again be required. Large spinners should have the hook attached with a split ring. Here you can use open or closed loop wire shaft because you will actually be making the shafts as you go. When using Real Pro's Commercial Tackle Maker you can easily make all of the loops in a totally professional manner. This handy tool is designed with the manufacturer or serious hobiest in mind. With a little practice, using this tool you can turn out hundreds of professional looking spinners a day. 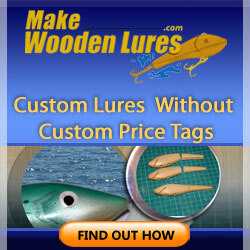 Real Pro's Commercial Tackle Maker is fully customizable. It can handle wire from as light as 0.018" all the way to 0.045" with no problem. It comes with all the parts with nothing else to buy. Using this tool you can make all of your wire forms for spinnerbaits, buzz baits, ice fishing spreaders, musky spinners, J and rigs of all kinds. Clear instructions are included with Real Pro's Professional Tackle Maker. Here is a quick summary of the steps involved. Cut a length of wire about two inches longer than the finished spinner will ^^ be. Now using the Real Pro's Professional Tackle Maker form the required loop. If using an open loop place hook in eye of wire shaft. Then slide spinner bodies down wire shaft while pinching the two ends together. Continue with the blade and clevise. ^^ Now using the Real Pro's Professional Tackle Maker create a professional looking perfectly round eye. Above: A French Combo spinner. It is similarto the French Spinner except it uses a worm hook on which is texas rigged weedless. Left: A sonic In-Line spinner with premium latex tubing on hook shank. 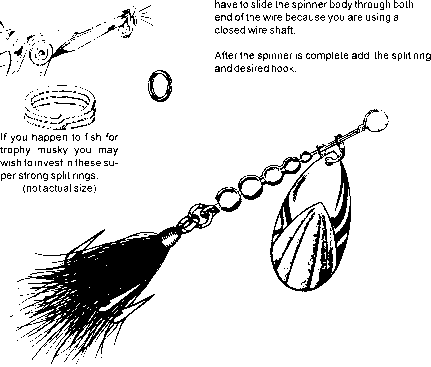 How to make bucktail spinners for fishing? How to make a closed eye wire shaft? How to make a inline spinner bait using a wire forming tool? How to Open Loop Spinner Making Tool? How to loop a wire shaft? Can i use wire cutters in place of needle nose pliers? How to use close loop spinners to fish? How to make open eye spinner shafts ? How to use a inline spinner making tool?